Approached The Mayor's Office to create "The Mayor's Gallery" holding ongoing exhibition programs feature local artists. Curated and installed its premier show entitled MALDEN ARTISTS - NEW WORKS featured 18 Malden artists. Project involvement included but not limited to organizing and planning, identify artists and theme, conducting studio visits, exhibition design and installation, invitation design, composing a html page for this exhibit on artSPACE@16's website, community outreach; support public affairs/PR, and reception. ...................................................................................................................................The Malden Mayor's Office is pleased to present its premier exhibit at the Mayor's Gallery. 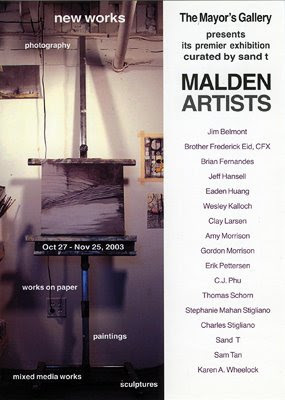 MALDEN ARTISTS - NEW WORKS Curated by SAND T featuring 18 Malden Artists: Matthew Andrade, Jim Belmont, Brother Frederick Eid, Brian Fernandes, Jeff Hansell, Eaden Huang, Wesley Kalloch, Clay Larsen, Amy Morrison, Gordon Morrison, Erik Pettersen, Cuong-Quoc Phu, Thomas Schorn, Stephanie Mahan Stigliano, Charles Stigliano, Sand T, Sam Tan, and Karen A. Wheelock. (Malden, MA - - Oct 13, 2003 ) - - A premier exhibition "MALDEN ARTISTS - NEW WORKS" was held at the newest exhibition venue in Malden - The Gallery at the Mayor's Office, located at Malden Government Center, 6th floor, 200 Pleasant Street, Malden. Exhibition opened from October 27 through November 25, 2003. An open-to-the-public reception with the artists was held on Thursday, November 6, from 6 to 8 p.m.This premier exhibit featured the new works of eighteen Malden artists and is curated by Sand T, artist/curator/director of artSPACE@16. Works on displayed included paintings, wall sculpture, works on paper and mixed media works. 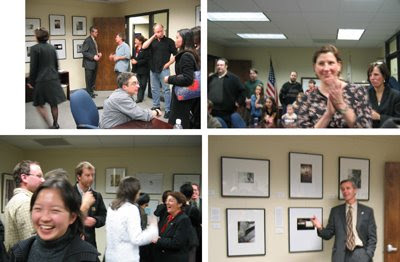 There was a photography exhibition installed in the conference room showcasing fine art photographs taken by Malden artists. These photos capture the many faces of this Malden community through their lenses in very creative perspectives. Matt Andrade says, "There is a gulf between the world that we see and the reality that lies behind it. We are physical, and we naturally view the physical world as the cornerstone of our existence." The gulf between spirit and body, mind and matter is what Andrade attempts to explore in his paintings. Andrade displays one painting entitled "Cathedral Series #2" - its an interior depiction of a cathedral with light permeating through its windows - as Andrade states, "Conversely, we tend to view the spiritual world as impermanent, and yet, this "impermanent" world can have much greater permanency than physical objects." Matt Andrade trained in Scenic Arts and Design for Theatre under Richard E. Schreiber. He received a B.A. from Northeastern University in 1982. With a few brief exceptions, artistic endeavors were set-aside until recently. Finally, after fifteen years in sales, Andrade has begun to seriously pursue painting. He lives in Malden with his wife, children and guinea pig and shares studio space with his cat, Smidgen. James Belmont's new works reflect an effort in bringing his painting to a larger canvas. His landscapes are derived from photos taken near Lenox, Massachusetts. Mixing imagination and reality, Jim enjoys blending what he sees in the photograph with his imagination and his sense of design to create these landscapes. The intention of his efforts is to move freely between the images in the photographs and those of the canvas. Jim Belmont was born in Boston, and has lived in Malden for the past ten years. He is a graduate of Dorchester High School and an Army Veteran of the Vietnam Era. Though he still has a few pieces of artwork from his high school years, his formal training as an artist had its beginnings in the mid-70s at Westark Community College, Fort Smith, Arkansas. He has attended design classes and from time to time has taken figure-drawing classes. He currently works for a large retail bank in the Metropolitan Boston area. Bro. Eid has worked in a variety of media include oils, acrylics, pastels, charcoal, pencil, pen and ink, watercolor, photography, and ceramics. He shows two photos and one works on paper in this exhibit. His work - loose and expressive - complements the strict order of his mathematical thought. His drawings celebrate the beauty of God's world and communicate the vitality and passion of the artist. Bro. Fred Eid is a teacher - and he does art when he can. For 32 years he has taught mathematics to high school students, first at St. John's Prep in Danvers and since 1977 at Malden Catholic High School. He advises students on the newspaper staff and in the photography club. During the past nine years, he has also taught some studio art classes, thus applying in the classroom a lifelong love and avocation. Jeffrey Hansell enjoys exploring the world at sunrise, sunset and sometimes in-between with his trusty Polaroid Image camera. Hansell thinks that the flaws and immediacy of the instant photo help bring out the inherent emotional quality or other-worldliness of his subjects. In this exhibit, Hansell shows 2 photos from a new series of photos he has been working on exposing the unnoticed beauty of Malden's old and new. Jeff spends most of his time in Malden working and meeting with a broad cross-section of mostly Maldonians who cross the threshold at Malden Access TV, where he serves as executive director. He initiated and helped to create the new MATV Art Gallery: a downtown venue for local artists and organizations located inside the facility of Malden Access TV. Eaden Huang has been living in Malden for the past 13 years. He is fascinated by the beautiful landscape of Fellsway Pond where he constantly revisiting every season to capture the ever-changing landscapes. The two photos he shows in this exhibit are taken in Fellsmere Pond. Eaden Huang has been tirelessly photographing for the past 15 years. He is a self-taught photographer. He attended a one -year Photography Workshop at Bunker Hill Community College in Boston, and later worked for Zan Productions, a commercial photography studio in New York City for 3 years. His photographs had been selected into the Public Photography Magazine Competition's Final award four times. Currently, Huang is hired as a professional photographer for many occasions such as weddings, receptions and community events. Wesley studied horticulture at the University of Maine and moved to Massachusetts shortly after graduation in 1992. He has been a resident of Malden for six pride-filled years. Clay Larsen's resent work explores hidden landscapes. Looking for blank spots on maps, no mans land between highways and industry, abandoned train tracks, landlocked hill tops and vacant lots, he finds open space, micro wilderness and occasional beauty. These open spaces are often abused eroded and abandoned but they offer a kind grease between functions. A lawless transitional area between regions of order. He then traverses them on his bicycle and occasionally documents them digitally. Clay Larsen lives and works in Malden. He studied landscape design at Umass. Amherst and currently works as a landscape designer and contractor. He has been involved with many forms of art from clay and metal sculpture to digital video and photography. Amy Morrison's latest work explores the concepts of the microscopic and macroscopic. Her thoughts and ideas for this series are informed by the world of biology as well as from her work as a psychotherapist. Amy enjoys the process of taking a larger experience, separating it into smaller fragments and then, in the hope of providing a fresh perspective, transforming it into something new. Through the medium of encaustic and mixed media Amy hopes to share her fascination with this process. Amy Morrison studied art and psychology at Bowling Green State University in Ohio and graduated in 1996 with BS in Art Therapy. In 2001 she graduated from Lesley University in Cambridge, Massachusetts with a Masters in Expressive Therapy, which is an inter-modal arts approach to psychotherapy. Morrison currently works in the North Shore area as an Expressive Therapist and is adjunct faculty at Lesley University. For Gordon Morrison photography is a form of meditation. It is a way of forcing himself to really appreciate a small, contained portion of the world that he may have previously overlooked. These images, for example, were taken at various times in his evening commute home. Gordon says, " In walking, we tend to tune out the world around us in favor of replaying the day's events or thinking of how we are going to deal with the next day's events. Here, with the camera, I have been afforded an opportunity to pause and consider the world around me for a moment, and step away from the world behind me and in front of me." Gordon Morrison received a bachelor of Liberal Studies in 1992 and has explored mediums and ideas ever since. His work has been shown at artSPACE@16, and can be seen at www.cerebuzz.com. When not making art, he spends his time working as a computer security and network specialist, renovating his home, and wishing he had more time to make art. Erik Pettersen shows two landscape paintings, which are based on landmarks and memories of nature. He gives his paintings an expressive and tactile quality, by the viscosity of his paint, bold mark making and varying color schemes. The dynamic use of color in his landscapes serves to trick the eye and play upon traditional rules of perspective. These paintings can evoke a sense of calmness or of turmoil. His compositions use elements of abstraction and the natural world, to create a unique perspective on traditional landscape painting. Pettersen's paintings have been shown in a variety of galleries throughout Massachusetts, including the Depot Square Gallery, Stebbins Gallery, ArtSPACE@16 and the Cape Cod Art Association. He is a graduate of Massachusetts College of Art, where he received a B.F.A., with a concentration in painting. Pettersen has a studio in Malden and works in Woburn. Cuong-Quoc Phu's love of nature inspires his devotion to paint botanical plants. He uses acrylic paint, graphite, charcoal and oil stick in abstractive mixed media. In this exhibit, Phu displays his latest body of work called "Sensory Plants". These paintings are inspired by Lyall Watson, a scientist and author. He applies texts and layers of paint that are collaborated to create a mixture of ingredients for the blank canvas. The blanket of prose adds texture, patterns, depth, and chaos, giving the sense that the painting itself is on a process of thoughts: undeveloped, unfinished and growing like wild weed. Cuong-Quoc Phu graduated from University of Massachusetts, Dartmouth in 1993 with a Bachelors degree in Fine Art in Painting and Illustration. He has been creating the Plantext series paintings for the last six years. His paintings are widely collected. Thomas Schorn's most current body or work addresses the physical elements of our earth. His objective is to illustrate how our world is a constantly changing panorama of natural and unnatural objects. He achieves this by manipulating digital images of land in Malden. By adding and removing man made objects he creates an artificial balance. Thomas Schorn has been living and creating artwork in Malden, MA for the past five years. He graduated from Rochester Institute of Technology in Rochester, NY in 1995 with a bachelor's degree in Fine Art Photography. Chuck Stigliano was born in 1955, the fifth of eight children. He was educated at public schools in North East, Maryland, where he learned a great many facts, most of which have been forgotten. Later he attended the Philadelphia College of Art, where he learned that art is hard work and requires discipline and commitment, which is good, because if it were easy, everybody would be doing it. In 1982 he married Stephanie Mahan of Lincoln, Massachusetts who taught him that sincerity in art, as in life, was rare and valuable and something to strive for. Later that year he became a graduate student at the University of North Carolina, where he learned that Art History was like a parent, to be treated with respect and eventually to be rebelled against. A daughter, Angela, was born in 1991, and from her he learned that he really didn't know much of anything yet, that his education was just beginning. 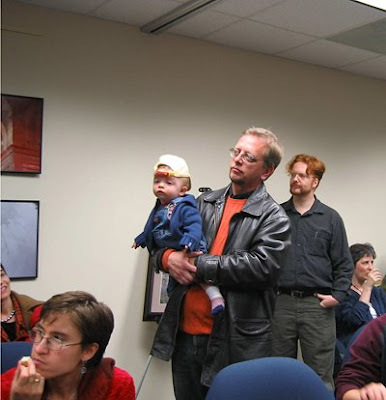 His son, Raphael, came along in 1996. From him he learned that second chances are possible, and that there was still much to learn. In this exhibit, he shows a wood carved wall sculpture entitle "Holy Family" a representation of the artistic Stiglianos living and creating art in Malden. Stephanie Mahan Stigliano works in diverse media. The work she is exhibiting here developed from time spent in her backyard garden. These are small intimate personal observations recorded in black and white slide transparencies, which were later printed as Polaroid transfers and emulsion lifts. This process allows the artist to print the photographic image onto a range of materials, which changes the texture of the photograph. The change in texture and the use of non-traditional materials expands the tactile range of the artwork. Stephanie Mahan Stigliano has lived in Malden for 13 years. Her artist's books and prints are included in the collections of the Fogg Museum, Cambridge, MA, the National Museum for Women in the Arts, Washington D.C., and the Boston Museum of Fine Arts. She has exhibited at Mobilia Gallery of Cambridge, MA; PROJECT of Wichita, KS; and the Society of Functional Arts of New York. She currently teaches in the Visual Arts Department at Pine Manor College, Chestnut Hill, MA. She has also taught at Bennington College, University of Massachusetts, Dartmouth, and Massachusetts College of Art. She has been a visiting artist at Glenwood School, Malden High School and Mystic Valley Regional Charter School here in Malden. Sand T initiated and curated this premier group show "Malden Artists - New Works" at the Mayor's Gallery of the Mayor's Office. She displays 2 documentary photographs entitled "An Artist Studio in Malden" and "Making Space for the Art in Malden" in this show. Documentary photography is one of her creative ways to construct a link between herself, her art, other artists, and the community at large. In these 2 photographs, Sand T presents an artist's studio in Malden and a space that has the potential to become an art happening venue - a common ground where people come together to appreciate art. She emphasizes the importance of the integration of art and community in our daily lives. Sand T says, "I encourage more artists, the public and private sector and the City to come together and realize the long-term endeavor of establishing an artist community to benefit the City of Malden." Sand T has experience working in event / exhibition planning and designing for more than a decade. She completed her Museum Studies program and graduated from Tufts University and the Museum School with a degree in Masters of Fine Arts in 1997. Her working mediums are painting, documentary photography, mixed media collages, sculptures and installations. Besides creating artwork in her basement studio at 16 Princeton Road, Sand T organizes contemporary art exhibitions at artSPACE@16, which she established as a non-commercial, artist-operated, artist-funded art space in Malden. Sand T believes her experience through creating art and making a space for art has given her a sense of self, a sense of possibilities, and the will and energy to join with others to create and strengthen the art community in Malden. Sam Tan shows one painting from his latest work series entitled Shifting Ground. This series recasts the traditional genre of brush ink Chinese landscape painting in a contemporary light. Tan currently has work showcases in the Boston Drawing Project at Bernard Toale Gallery, Boston and the Pierogi Flatfiles in Brooklyn, NY. He has recently exhibited at HallSPACE in Boston, the Photographic Resource Center in Boston, and the Arlington Center for the Arts. He was awarded a scholarship from the Archie D. and Bertha H. Walker Foundation. Karen A. Wheelock loves the beauty that she sees when taking photographs and enjoys being able to recreate this beauty in the print. Being out in nature has a very soothing and calming effect for her. This is conveyed in her photographs. Wheelock is a Social Worker by profession and finds photography a great way to reduce stress. The two photos exhibited exemplify this. One is of the Wetlands near her home and the other is a pond at Pine Banks. Through photographing the Wetlands, Wheelock hopes to remind us of the beauty wetlands possess. Wheelock says, "This property is owned by a developer who wants to destroy the wetlands. We all need to fight to save what natural lands that we have left." Artists and community members took an evening trip to City Hall for an opening reception of the Mayor's Gallery, a sign of growing cooperation between artists and city officials. Organized by Mayor Richard Howard and his office, the gallery features artists who live or work in Malden. Many of the works are of subjects around the city. "Between MATV and City Hall, you'll have two galleries downtown. We're going to try to cooperate and refer people to each other," said Jeff Hansell, a director for MATV whose photographs are on display in the Mayor's Gallery. Hansell, whose photographs on display include a color portrait of the Malden River, said that the art is an excellent addition to the mayor's office. "It changes the whole space," he said. Thomas Schorn, who has lived in Malden for five years, said that the Mayor's Gallery is a positive step. He praised the city's arts community, especially Sand T, an artist and gallery owner who has been involved in collaborations with city government. "Sand T had pushed me to show here," Schorn said. "She's talked about community-building. We came here to speak to the Mayor this year, and that's spawned this show." Schorn's abstract painting "Flying Machine" is on display in the show. It combines light blues, pinks and yellows, sharp angles and smooth curves, with patches of patterned paper showing underneath. "I start with a layer of collage underneath," said Schorn, who works out of a home studio. "I draw on top of it, and fill in the spaces with color." Schorn said that a full flowering of the arts scene in Malden will require more studio space and more gallery space in the city. "The town doesn't yet have a place where people can come together and make art," he said. "Everyone I know works out of their house, and the community can only grow to a certain size when that's the case." City officials are hoping to answer Schorn's concern through efforts to build studio space in a storefront on Pleasant Street and the proposed purchase of the Sacred Hearts Church convent on Irving Street as live-work space for artists. Linda Thorsen, a Malden resident for 14 years, said the city's attention to the arts is helping her feel more connected. She said that the use of the arts to improve downtown is a good idea. "The city's getting more supportive of the arts, and it seems like there's more focus," Thorsen said. "I'm impressed with the focus lately on redevelopment in the downtown. It's great to see the people in a position to do something about it getting involved. It's something creative that you don't usually see from town governments." Thorsen said the artistic community is making a valuable addition to improving the city. "I'm impressed with the people here tonight," Thorsen said. "It seems like everybody here is interested in getting things done. I'm excited by the prospect of the artists' space on Pleasant Street." Howard said that a lively arts community is a key to revitalizing the city's downtown area. "Hopefully it's a seeding effort that can attract some of the artistic community of greater Boston," Howard said. "We'll be capturing retail, new housing, and banking, but to have it be a rich, vital environment, the cultural part is very important. There are a lot of talented artists living or working in the city." The exhibit runs through Tuesday, Nov. 25 and is open Monday, Wednesday, Thursday 8 a.m. to 4 p.m., Tuesday 8 a.m. to 7 p.m., and Friday 8 a.m. to noon. For more information 781-397-7000. A splash of color has been added to City Hall: photographs in the conference room, landscapes in the hallway, majestic oils in the lobby. It's all part of the first-ever Mayor's Gallery, in which artists who live and work in Malden got the opportunity to put their works on display in the mayor's office atop City Hall. "It's part of a larger plan to add artistic and cultural components to the Malden Square area," said Mayor Richard Howard. "It ties in with a number of initiatives we're in the midst of completing. This exhibit is a small component, fitting into what we're doing at a macro level." In Howard's vision, the entire downtown area, from the library and high school all the way to City Hall, will be a haven for artists. With a storefront on Pleasant Street already under Redevelopment Authority control and negotiations under way to buy the Sacred Hearts Church convent on Irving Street, city officials expect to have studio space available for dozens of artists. "It's part of our larger game plan for revitalizing downtown," Howard said. "You can't just do one or two little things. You have to do it right. You need to find the right partners, and make it an intrinsic part of the community." In addition to putting in new studio space in the acquired properties, Howard hopes to make use of the Jenkins Auditorium at the high school as well as the galleries in the library to make Malden Square an artistic and cultural center. "The potential at Jenkins is to have a one-of-a-kind facility," Howard said. "It's a link between arts and the schools, a location to attract after-hours activity, and a chance to generate some revenue. We'd like to bring musical, dramatic, and dance activities, and we'll reach out to groups around the North Shore, including universities. Another component is the Blue and Gold Gallery at the high school. We see a natural association between what can happen at the high school and what can happen at the library, the establishment of the museum wings there. The goal is to have an effort that's consistent." Howard said that bringing in cultural activities is a key portion of the larger project of downtown revitalization. "This is a seeding effort that can hopefully capture some of the artistic community of greater Boston," Howard said. "We think Malden Square can be part of that community. We'll be capturing housing, retail, banking and some other sectors in our downtown, but to have it be a rich, vital environment, the cultural aspect is important. There are a lot of talented artists here in the city." Somerville's Davis Square is a model of what Howard hopes the arts can do for Malden's downtown district. "I'm convinced that Malden Square has great potential, with a mix of commercial activity, housing activity, access to the T, government activity, and now the arts. It has a unique blend of features that could be a special opportunity, and the square has the potential to be a real destination." Malden's marketing director, Debbie Burke, said that collaboration with the city's artists has been rewarding for the city. They want to get actively involved in the city," Burke said of the core of artists assembled at the gallery. "They're willing to give back to the city. They're energetic and enthusiastic." Until his plans come to fruition, Howard is happy to take the first step by allowing the artists' work to be shown in City Hall. "Everybody in the building has come up to look," he said. "It's been a good thing for all of us." The Mayor's Gallery exhibit is open to the public during normal City Hall operating hours: 8 a.m. to 4 p.m. Monday, Wednesday and Thurday, 8 a.m. to 7 p.m. Tuesday, and 8 a.m. to 12 p.m. Friday.